Wine-tasting in Italy is almost a traveler’s rite of passage, but few tours explore the equally rich traditions of vinegar production. 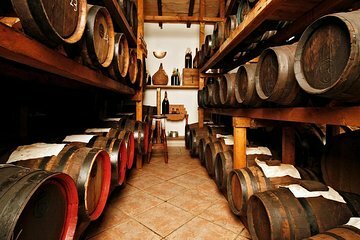 With this tour, visit one of Modena’s oldest traditional balsamic vinegar producers, touring the vineyards and seeing all the stages of production from the pressing of grapes to the barrel aging. The tour includes plenty of vinegar samples, regional food tastings, and a bottle of wine produced on-site. We really enjoyed this tour which ended up being a private one as no one else signed up that day. The tour was given by a member of the owning family who was gracious enough to pick us up and drop us off at the nearby bus station. We learned everything about the laborious process of making this wonderful product, got to sample different vintages, and they laid out a nice spread of local products including their own Lambrusco. Highly recommended. This was an amazing experience. We learnt so much about Balsamic vinegar and the other specialities of the region. The history and focus on producing a quality product that spans generations was difficult to comprehend when compared to a world of instant production and gratification. Our host Macello was was wonderful.The sampling of the various aged balsamics was very special. I strongly recommmed this tour. Oh my goodness. This tour was everything I wanted and more. FYI that it does not include transportation to the acetaia itself, so you'll need to figure out how to get from Modena/Bologna to the countryside. I rented a car and drove up from Florence...driving in Italy - another experience!! Before even heading up to the acetaia, though, I called the proprietor directly because I wasn't exactly sure which address to use and what time to arrive. They were so helpful and sweet, so calling them was no problem. Upon my arrival, I parked at the acetaia and was wonderfully surprised to learn that I was the only person on the tour that day talk about a joy!...A solo tour is not to be expected, but it was a random day in mid-January. So I spent 2 hours on a private tour of this lovely acetaia, learning about this amazing process, with the kindest of people. Marcello, the 6th-generation vinegar producer, first welcomed me, introduced me to his father and father-in-law who happened to be the only other people there, and then proceeded to give me an amazing tour of the acetaia and the processes of making both Traditional Balsamic Vinegar of Modena, D.O.P and I.G.P and explaining just exactly what those differences are. I saw the land, the press/cook/vat machines, and allll the amazing different types of barrels used in the aging process, including the oldest barrels, made in 1860!! I learned so much about this amazing vinegar-making process, and Marcello was an absolute charm the whole time. He also showed me pictures of all the generations who have had vinegar barrel batteries, including the very first father to buy his son a battery for this particular family. We ended the tour with a tasting of TBVoM IGP, a condimento, TBVoM DOP 12 and 25 years, and also a 100 years aged one. Just. Simply. Amazing. The family also makes wine, so Marcello blessed me with a glass of wine I had to say not too much!, as I was driving!, and a plate of delicious meats, cheese, and crackers. To sum it all up, I was on cloud nine the whole time, learned so much, tasted so much, and just couldn't have been happier. I left having bought my own personal black gold, an extra vecchio TBVoM, DOP, plus one of their 6-year-aged TBVoM, IGP. I cannot recommend this tour more! The family has been an acetaia since 1860, but they only started giving tours 2 years ago. They are a wonderful family, business, and tradition. Go, see for yourself, and just try not to imagine yourself moving to Modena after this and becoming Marcello's neighbor...I dare ya! This tour was SOOO good. It is definitely worth it. Doing a tour here is truly a once in a lifetime opportunity. The most amazing part about the tour is that it is led by a young gentleman who can speak English very well and actually makes balsamic vinegar with his father using traditional methods. He explains every step perfectly and carefully answers each and every one of our questions. I was very impressed with his customer service. Getting a tour from a family owned factory is a totally different experience than stepping into a factory where things are done by machines and people are hired to work. It was so cool to hear about the family history and learn about how each family member has their own set of barrels and the process that has to be prepared years upon years ahead of time to make balsamic vinegar for each family member and for the business. The fact that each family member has their own barrels indicates to me that it is truly their passion project to be operating their business and they love their product. The tour cost includes lunch which was a beautiful spread of 3 meats mortadello-the meat from the region, salami, and a third local meat. I absolutely loved that third local meat. I hear that you can't find it in other provinces of Italy because it is specific to that area so it was nice to try it. Lunch also included wine that they make, bread, and parmagiano reggiano with their tasty balsamic vinegar. If you consider the time they spend on us and the cost of the lunch provided, they really aren't a ton of money so do try to support their business by buying some of their amazing balsamic vinegar. The taste is out of this world. I've only experienced sub-par balsamic vinegar in my local grocery store in the US and always shy away from it. This stuff is truly black liquid gold. I tasted balsamic vinegar aged up to 100 years which was super cool to compare against one another and other tours close to Modena only have balsamic vinegar aged up to 25 years which they call super old. This place has also won numerous competitions because their stuff is just that good. Keep in mind that if you want to hire a tour company to take you to a balsamic vinegar or parma factory, for example, it typically costs 100-200 euros per person then you would have to rent your own car or pay for transportation I found a place that wanted to charge 300 euros for them to provide a vehicle. The only downside of this place is that it is far from the city center so transportation there is not cheap. Tip: Download an app called appTaxi and make a reservation ahead of time for a car to pick you up from the train station or your hotel at a specific time and take you to the factory. appTaxi does operate in the Modena area and other parts of Italy. Make sure to have the address written down too because our driver still wanted to see it even though the address was in the app. Also keep in mind that they charge from when the taxi starts heading to your location. I was staying in Bologna and took a train to castelvetro emilia only 3.5 euros/person. There were no taxis outside so good thing I ordered a taxi but when my taxi came, there was already a 20 euro charge there. It cost a total of 53.5 euros for me to get there and another 58.5 euros to get from the factory to Modena. The tour guide helped call a local taxi but unfortunately the surcharge when I got into the taxi was already 28 euros. Also keep in mind that if you take a train to Modena instead of castelvetro emilia, the Modena train station will likely have taxis stationed outside since it is a bigger town and therefore the surcharge shouldn't be there the Modena stop wasn't great for me because the train ticket cost 25 euros/person. I want to emphasize that even though I am whining about the 112 euros in taxi cost to and from the factory, IT WAS STILL VERY WORTH IT FOR ME. The experience was truly a great one to learn about their art of making balsamic vinegar but to really do so from the point of view of the family. Just keep the transportation cost in mind and be ready to pay for it. My only suggestion to them is to offer the option to pick us up and drop us off at the city center for a specific cost if the customer is interested. Fantastic tour of a great family-run production. We got to see the traditional methods of balsamic production and sample amazing vinegars up to 100 years old. Highly recommended! Highly recommended balsamic vinegar experience. We learned all about the history of this multi-generational family owned company and the practices used to nurture the vinegar. Unlike making wine, the balsamic casks need air flow and light to bring out the best flavor. The openings in the tops of the casks are covered with linen, rather than corked, and exude a wonderful fragrance. We tasted the vinegar at several different ages, including one that was 100 years old. We were served some local cheese and cured ham, which is not like anything available in the United States. The owner and his father were attentive and answered all of our questions. I purchased some of their products and I'm enjoying them on a daily basis. Items can be purchased online, also. Unlike my wife, I am not a Balsamic vinegar afficionado. However, this tour amazed me. I had no idea that this would be an experience that would allow me to understand why people crave, and rave about, real Balsamic. I even found out why it's called Balsamic. The history and the tour were fantastic, in the real sense of the word. Imagine a family-run business/tradition that has been in continual operation since 1860 imagine barrels over 150 years old that are still producing DOP Balsamic. Our guide, Marcello, who is the great-grandson of the founder, was fluent in English, charming, informed, gentlemanly and enthusiastic. His father's English was inexistant but that didn't prevent us from having a warm conversation and sharing jokes. The actual tasting of the various products, as well as cheese from the neighbouring formaggieria, and the family's own wine, was an eye-opener. The setting is rustic, and a pleasing ride from downtown Modena. A two-hour tour that is truly excellent value for the money. Go for it if you possibly can! What a great tour! Such a great experience touring the family Balsamico place that has been making balsamic for over a hundred years. A special experience. What a pleasant and educational experience this tour was from the start to the conclusion. Our guide, Marcello, explained every step of production from growing and caring for the grapes to the final bottling. The family history is a story in itself as Marcello spoke of a very long trail of love for the process and purity of product. I would do this tour again just to taste the 100 year old Balsamic vinegar again. Just do it. What an education steeped in history and heritage. Paulo and Marcielo were friendly and hospitable. A great experience!